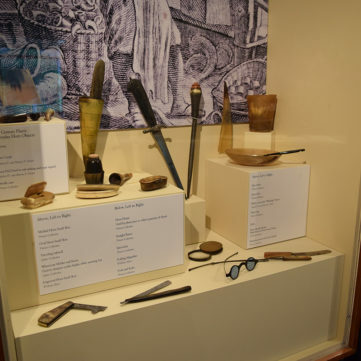 Few objects from colonial America had such a personal connection to their owners as the powder horns used by soldiers, settlers, and American Indians to store the gunpowder necessary for their survival. 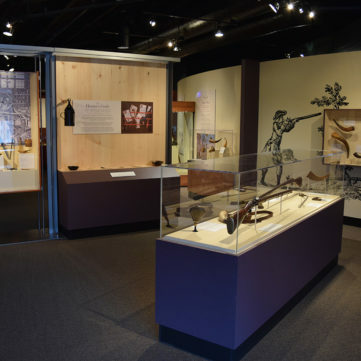 Beginning this Fourth of July weekend, the Fort Pitt Museum – part of the Senator John Heinz History Center museum system – will reveal the stories behind these delicately carved objects as part of a new exhibition, From Maps to Mermaids: Carved Powder Horns in Early America, which opens this Saturday, July 1. 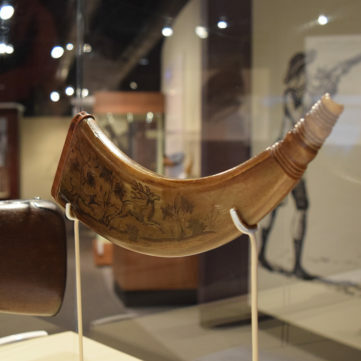 In a world where firearms were necessary tools, the powder horn – made from the lightweight and hollow horn of a cow – served as the constant companion of thousands of frontier residents. 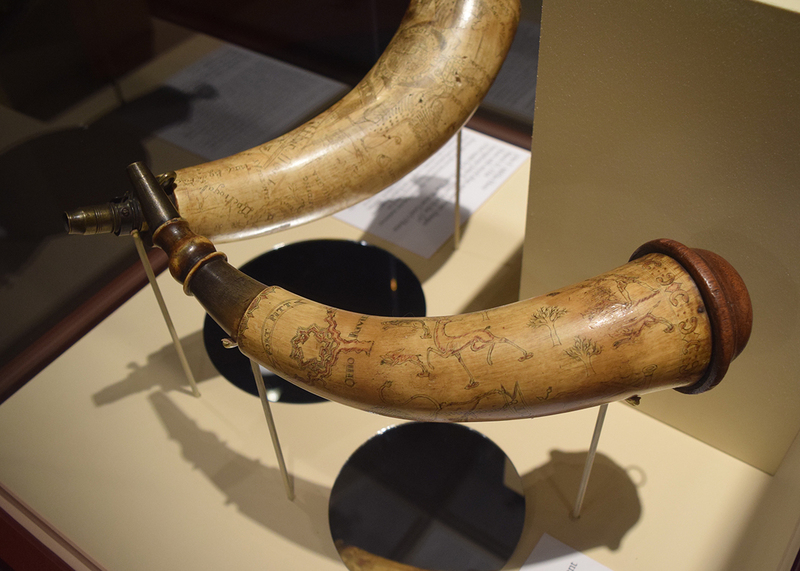 While powder horns kept gunpowder dry, many owners also recognized the smooth surface of the horn as the ideal place to leave their mark. 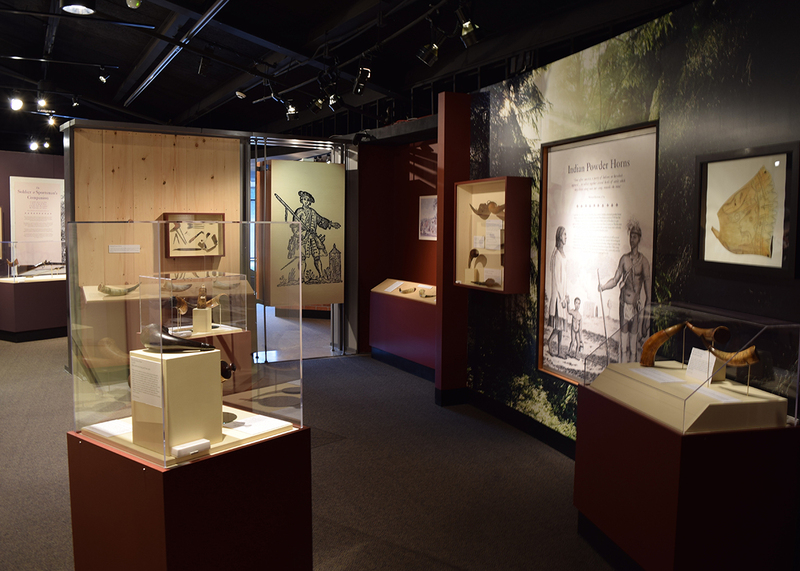 They etched names, dates, maps, and war records, as well as purely whimsical figures, into the objects. 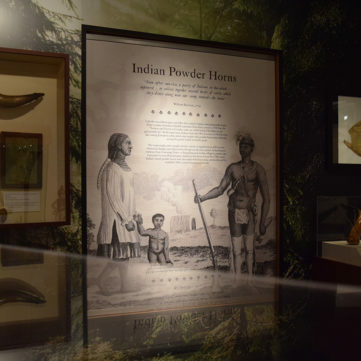 Many carved powder horns found in Pennsylvania in recent decades illustrate stations along the Forbes Road from Philadelphia to Pittsburgh and include some of the earliest first-hand depictions of Fort Pitt. 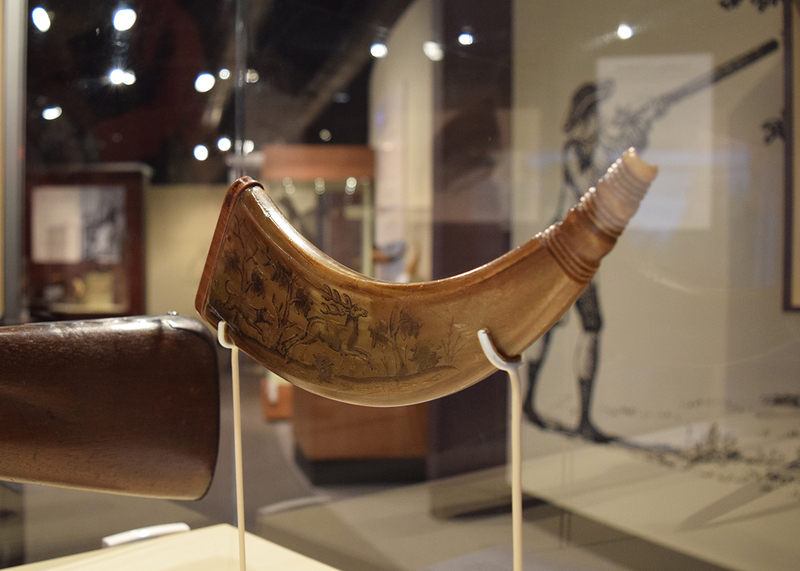 Surviving in large numbers, carved powder horns represent early American folk art in its purest form and serve to illuminate the past. 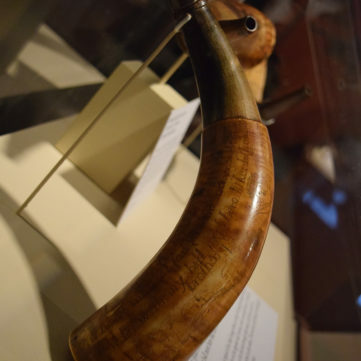 An American Indian-carved horn with numerous depictions of animals, including a Horned Underwater Panther, a mythical creature that appears in the beliefs of Great Lakes and Eastern Woodland Indians. 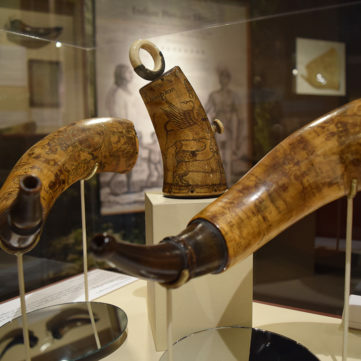 The Fort Pitt Museum’s temporary exhibit From Maps to Mermaids: Carved Powder Horns in Early America begins with a discussion of the cow horn and its many uses in colonial America. 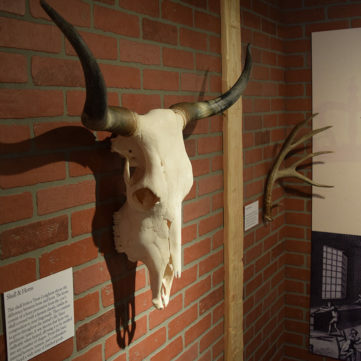 To convey an understanding of the end product, the exhibit begins at the source, explaining how cheap and abundant horns from cattle were harvested by slaughtermen, then processed by horners and combmakers. 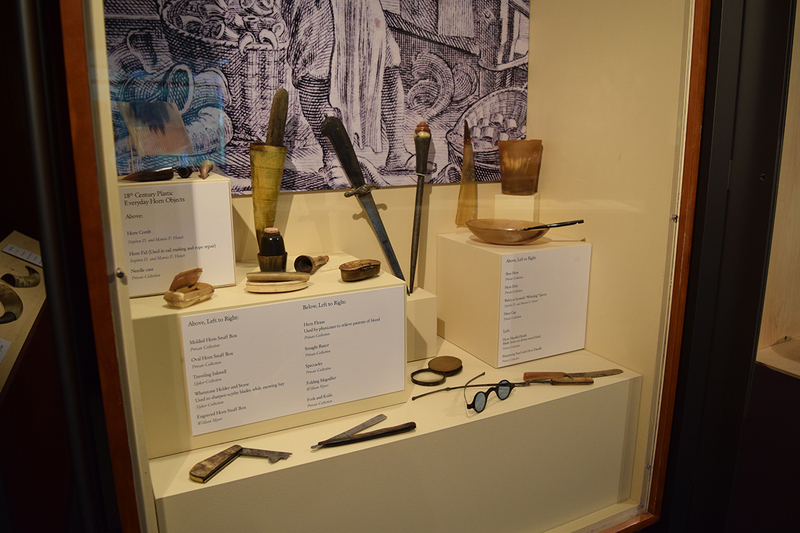 Long before they were used to safely contain gunpowder, horns were used for cups, combs, boxes, and other utilitarian goods. 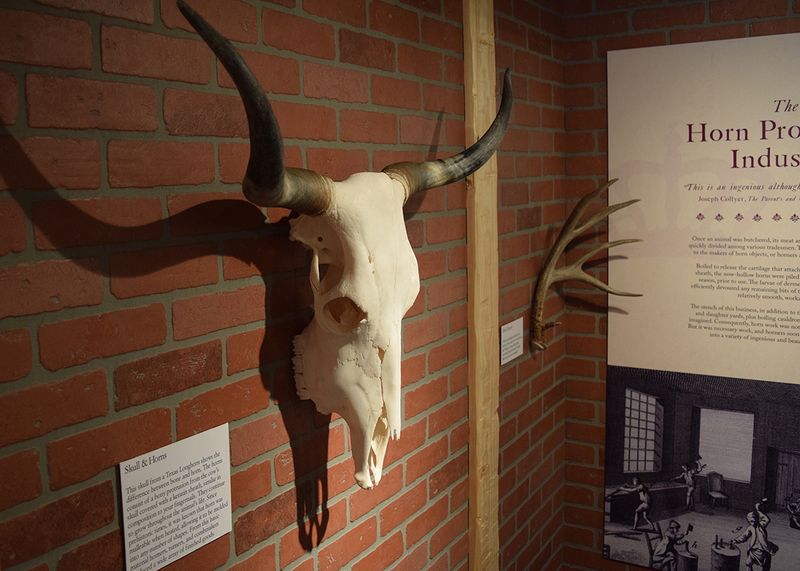 Able to be pressed and molded with the application of heat, horns were the plastic of the 18th century. In Europe, where firearms usage was limited to soldiers and genteel sportsmen, a variety of elaborate pressed and molded horn flasks were used. Like their counterparts in America, European artisans often decorated their horns with carvings highlighted by the application of dark pigments. 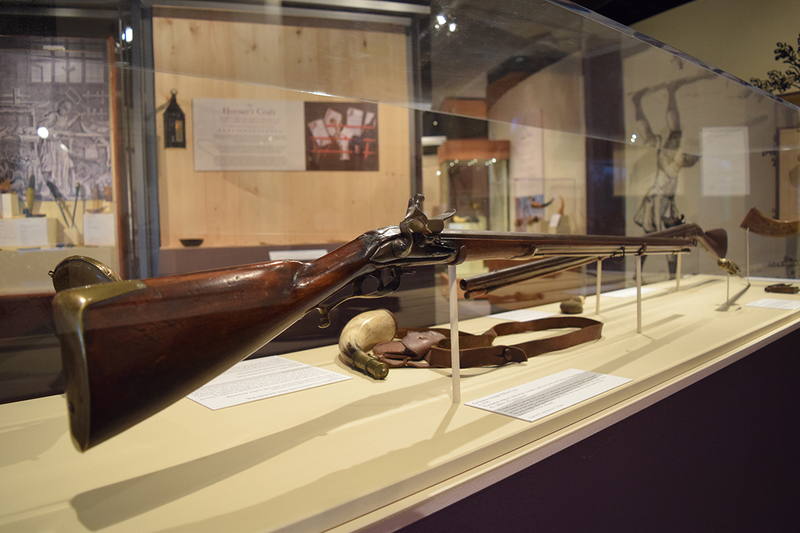 European sportsmen used a variety of weapons, including smoothbore fowling guns (for bird hunting) and rifles such as this. 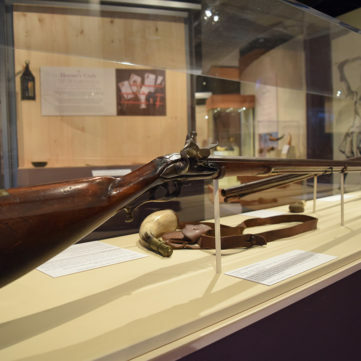 Made in Europe around 1745, it bears strong similarities to the earliest known American rifles. 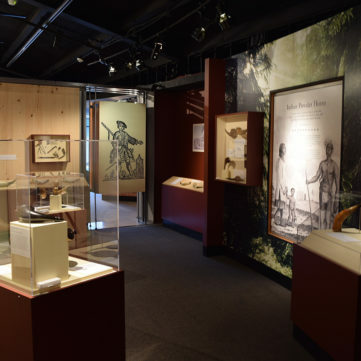 Having covered European arms and accoutrements, the exhibit explores powder horn usage in America, highlighting horns made during the French and Indian War (1754-1763) through the American Revolution (1775-1783). 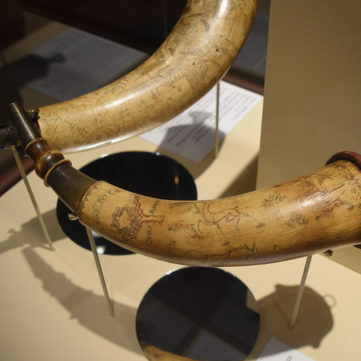 Fought between the 1680s and 1760s, the colonial wars between Britain and France produced numerous powder horns, made and engraved by private soldiers and professional artisans alike. 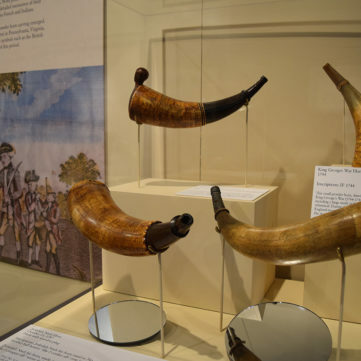 The last conflict — often referred to as “The French and Indian War” — saw the emergence of several schools, or styles, of engraving that established the design vocabulary of later American horns. 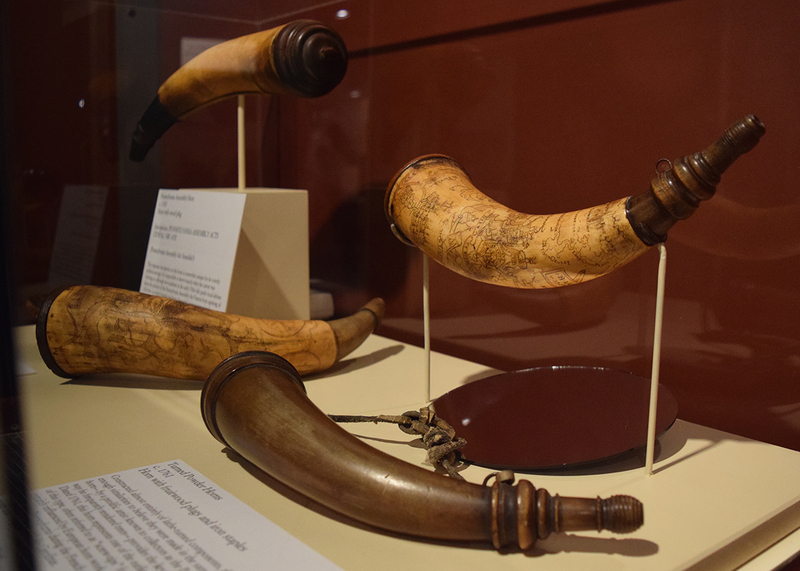 These horns showcase the highest level of the 18th century powder horn engraver’s craft. Often made for officers in British and provincial regiments, they were compact and portable souvenirs of military campaigns in North America. 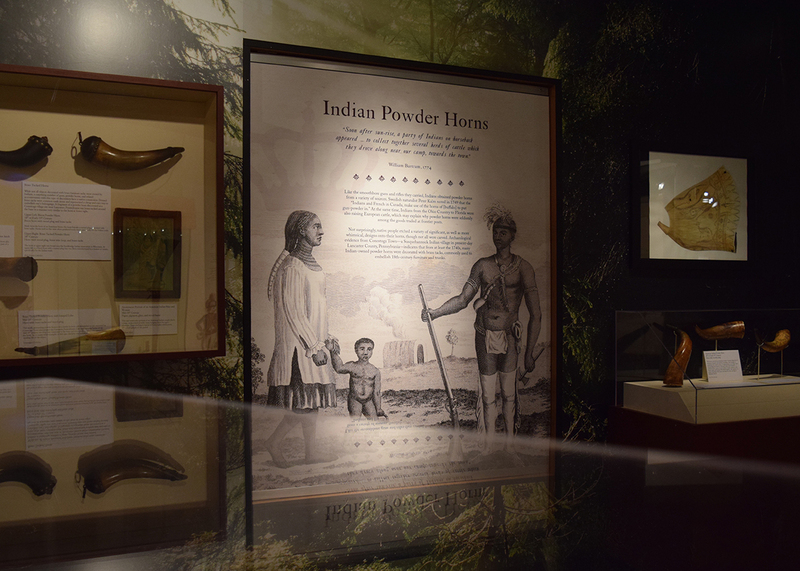 Like Europeans and American colonists, Indians made and used powder horns to carry their gunpowder. 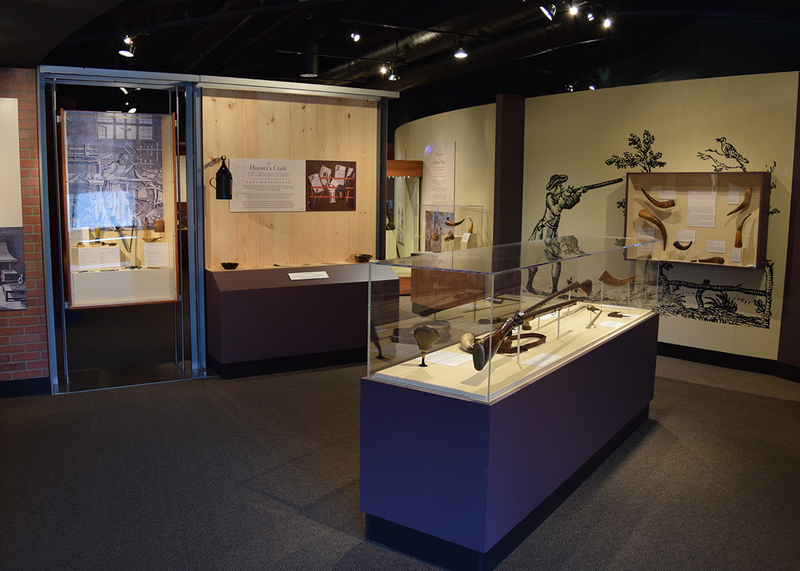 A special section of the exhibit discusses the use of brass tacks on horns known to have been carried by American Indians. 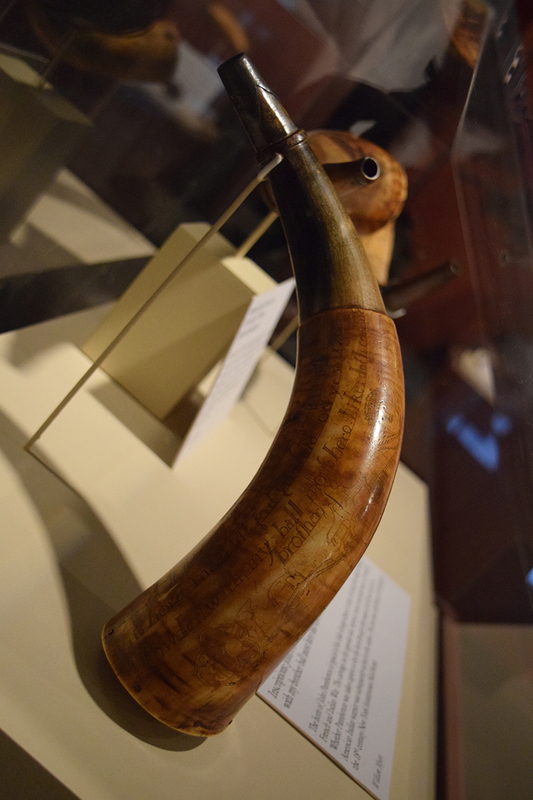 Made for colonial soldier John Paemberton during the French and Indian War, this horn eventually ended up in the possession of an American Indian who carved his own elaborate war record into the opposite side. 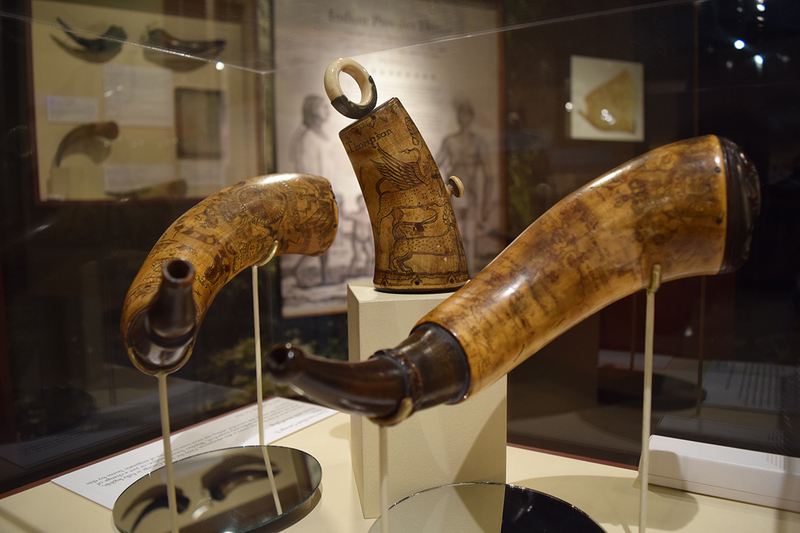 Powder horns made at, or depicting, Fort Pitt are also featured in the exhibit. This example was carved by a professional engraver known to collectors as the “Pointed Tree Carver” for the way he often rendered trees. Like many souvenir powder horns, it may never have seen service during the war. 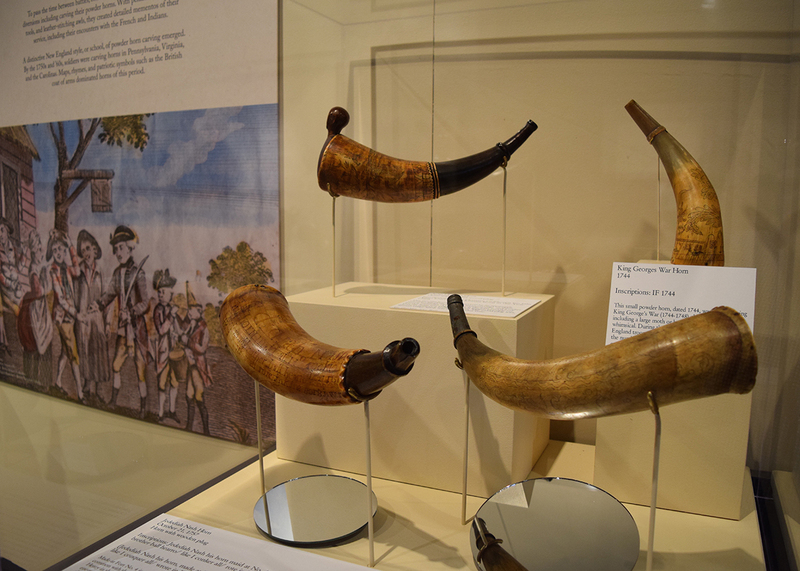 While most New York and New England powder horns were made entirely by hand, a different tradition emerged in Pennsylvania and points south. 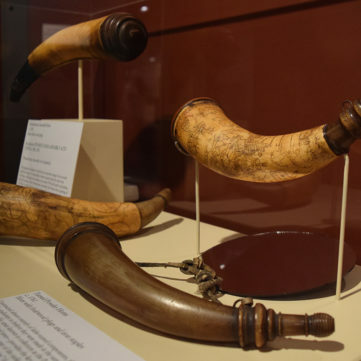 Produced in workshops in Philadelphia and other urban centers, many key elements of these horns, such as plugs, collars, and spouts, were turned on foot-powered lathes. This labor-saving technique enabled horners and combmakers to efficiently produce large numbers of expertly crafted powder horns.